- At sunrise, Rick is attempting to contact Morgan through the walkie-talkie. - Andrea has not left Amy’s side even though she is dead. Rick tries to talk to her but she threatens to shoot him if he interferes. - The group burns the Walkers. Glenn doesn’t want dead members of the group to be burned. - The group learns that a zombie bit Jim. They decide they need to go to the Center for Disease Control in order to get him better. - Dale talks to Andrea about his dead wife in order to get her to leave Amy’s side. - Ed’s wife uses a pick ax on his head multiple times to make sure he stays dead. - Amy begins to come back to life, but as a zombie. Andrea shoots her in the head. - Shane and Rick argue over the blame of the zombie attack. Lori doesn’t fully agree with Rick’s actions and decision to find the CDC. - Jim starts having hallucinations of zombies before feverish delusions. - Shane and Rick continue their arguments. Dale catches Shane pointing his gun at Rick. 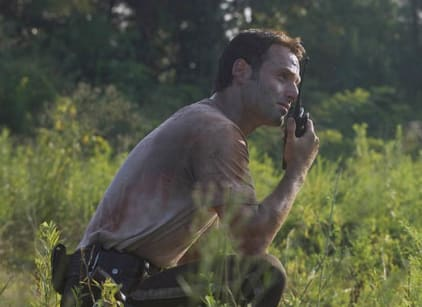 - Rick speaks on the walkie-talkie hoping that Morgan hears that he and the rest of the group are headed to the CDC. - Morales and his family decide not to go with the group. - After the RV breaks down, Jim requests to be left behind. - Jenner from the CDC records “journal entries.” He is living underground as he attempts to work on curing the disease. He has become restless. - He accidently gets the best samples destroyed due to decontamination. The affects of being alone make him contemplate suicide. - The group arrives at the CDC. Flies and bodies are everywhere. It’s beginning to get dark and the group is desperate. - The door opens and the group stares into the bright lights inside.